Canon's EOS 400D has been instrumental in driving the budget SLR market. 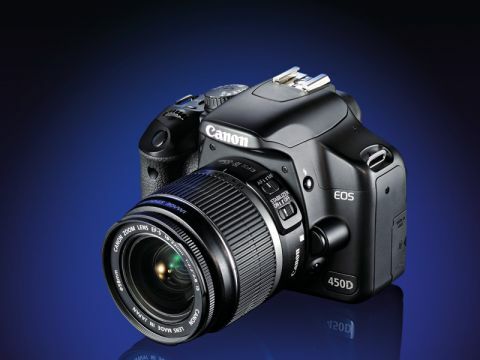 Now the Japanese giant has released an upgrade to the 400D, the Canon EOS 450D. The main changes are two million more pixels, a new, easier-to-handle chassis and Live View, which shows what the camera is 'seeing' on the rear LCD. Certainly, having two million extra pixels to play with is helpful, if hardly earth shattering. Canon's 12-megapixel sensor does a good job of keeping noise down and image quality high, and that extra capacity means you can enlarge your pictures, or crop them aggressively in software while retaining detail. The Digic III image processor also helps to deliver smooth, well-saturated colours. It has to be said, though, that JPEG images taken with the 450D are on the soft side. This appears to be an issue with the camera's internal processing, rather than with the quality, image-stabilised lens. All digital photos require some sharpening, and it's a definite requirement for 450D owners. We don't regard this as a fatal flaw, however, as anyone who goes to the expense of buying an SLR should try shooting in RAW for maximum, uncompressed quality. And RAW images taken with the 450D are really very good, as well as being a joy to process using the supplied Digital Photo Professional software. Taking great RAW shots is also helped by the improved camera interface. There's now a dedicated ISO button for adjusting light sensitivity, and you can whack up the ISO over 1,000without noise becoming a problem. Meanwhile a Highlight Tone Priority function helps to preserve detail in the brighter parts of the image. The 450D is quick too, and can shoot 3.5 frames per second. Top burst speed lets you fire off six RAW shots or an impressive 53 high-quality JPEGs. As for the new Live View feature, it's certainly useful. Live View makes it easier to compose still life, for example, or arrange a portrait shot without constantly squinting through the viewfinder. What's more you can call up a live histogram so you can check the exposure range before you take the shot. Just be aware that Live View will drain the batteries quicker. Tested alone, the 450D seems like a no-brainer for £550 with a great 18-55 lens. Canon's problem is that the equally attractive Nikon D80 and Sony A350 SLRs are selling for £50 less.